Set near Vienna’s new central train station the Mooons hotel will be the first of its kind. A dedicated hotel for the smart business traveler. 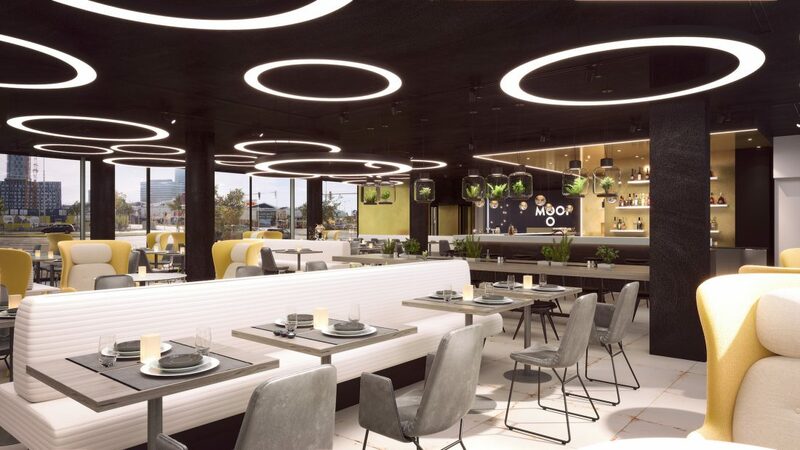 Extravagant design, inspiring cuisine in combination with intelligent ideas at surprisingly affordable prices – that’s what MOOONS stands for. We had the opportunity to support Moser Architects and Bridge Group right from the beginning of the design process by translating their ideas into realistic images and so refining every design decision from the largest to the smallest. Since this should be the first location of many of this new hotel brand our client’s expectations were high. Getting everything perfectly right to be sure so that their concept translates into a unique and functioning space. They needed precise images right from the beginning so they could feel the space. This process was not done in a day it rather was an a series of productive bursts. Our team kept creating images of every phase of the design process, resulting in a very efficient and transparent method of visual communication. That same precision was kept throughout every relevant area of the hotel. When MOOONS came up with the idea to use VR to present the hotel at a press conference and later in a traveling showroom, we got all excited. We opted for pre rendered stereoscopic images to maintain the level of realism integrated in an interactive app built in the Unity game engine to keep the user experience as immersive and simple as possible. The a device like Samsung’s gear vr seemed perfect and since we worked on the project for so long all areas of interest were already perfectly prepared for 360 degree panoramas. The whole experience for the viewer should be of a cinematic quality and we wanted to offer a little more than just a simple slide show. Of course the prototypical room. A small space with a huge and spectacular, perfectly circular window to the street. Since the room was the first part of the hotel we worked on, every aspect of the design was highly refined. Getting everything right from the materials to the different moods was obligatory. We suggested two point of views. One near the entrance and one right beside the window. That would have been enough to show the design of the room but we decided to also show the atmospheric nightly light setup, which the user can turn on and off interactively. The ground floor is the biggest area we show. Starting from the entrance, the reception area, different views of the bar and restaurant the user can take a virtual walk, experience the space and even go out into the garden to hear the birds twitter. All the while the exploration is accompanied by sounds and music that sets the atmosphere. The rooftop bar in the 10th floor is another unique asset of the hotel. The view opens up to spectacular 360 panorama of Vienna. To the east is the buzzing area of the new train station and looking to the west you can enjoy the perfect view across Vienna with all the major sights right in front of you. The combination of real panoramic photos and rendered stereoscopic images and an atmospheric soundscape works just perfect. All these different areas are connected by an interactive menu screen that shows the facade of the hotel. By looking at the different areas the user can select one of the three areas. This menu is not pre rendered and uses the engine to display an abstract 3d model of the building set in a simplistic, dark universe. Using 3d data instead of rendered images we were able add slight movements to elements of the facade and a touch of interactivity for the user. This was our first time we created a VR experience for a client and we got hooked instantly. There is a huge potential to let clients “be” in a space and let them experience rooms in a completely different way. Our product always was “the image” but this (technically) little step changes our work to a “3d spatial experience”. Of course we are aware of the current limitations but we think VR is here to stay and it will change how architects design and how real estate developers communicate with their clients.